Food spoilage: it happens to everyone, and it can be complete mood killer, especially if you were hoping to impress friends and family with your from-scratch guacamole. Few things are more frustrating than reaching for an item in your refrigerator only to find that it’s inedible. While it’s impossible to preserve foods indefinitely, there are measures you can take to help ensure your groceries maintain freshness. Follow these three essential tips on how to keep food from spoiling. Set your refrigerator to the correct temperature. Do you remember the last time you checked the temperature in your refrigerator? If not, it’s a good idea to peek at its current setting to make sure it’s not too warm. After all, bacteria thrive in warm temperatures. We recommend a setting of 38 degrees Fahrenheit. Most refrigerators on the market today come equipped with a digital thermostat to allow for quick and easy adjusting. For older models that use a dial system, you can check the temperature with a meat thermometer. Follow this step-by-step guide from Do It Yourself on how to test the temperature. Store items in the right compartments. 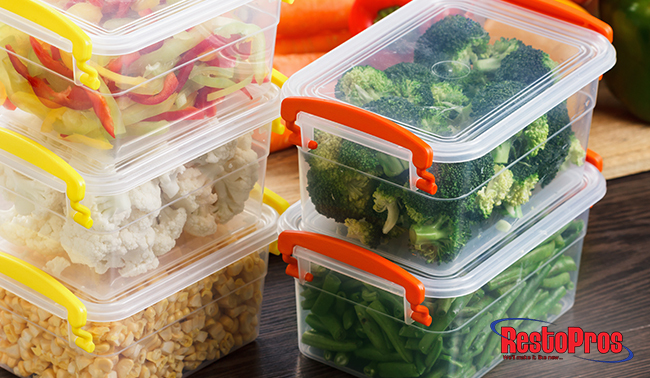 Fruits and vegetables should go in the crisper bins. Place fruits in one and vegetables in the other. Separation is necessary because both require different humidity levels. Your vegetable drawer should have a higher humidity setting than the fruit drawer. Raw meats, eggs and dairy products should go on the lower shelves because they are the coldest. Because raw meat contains bacteria that can spread, designate an area where only these are placed, and clean it regularly. Store foods that don’t need to be cooked, like dips, leftovers, deli meats and drinks, on the upper shelves because these areas provide the most consistent temperatures. Know which items actually belong in the fridge. Determining the best place in your kitchen to store produce and other perishable goods can be difficult. When in doubt, many people turn to their fridges because they think it can’t do any harm. Unfortunately, for some foods, the fridge actually speeds up the spoiling process. Not sure where exactly to store your groceries? We can help! Keep tomatoes on the counter at room temperature, like you do bananas. Onions, potatoes and squash prefer a darker, cooler environment with low moisture, like your pantry. Avocados are the free spirits of produce. They can go either in the fridge or on the counter. If you’re not planning to use them for a few days, we recommend placing them in the fridge to slow down the ripening. For peanut and other nut butters, it’s really up to you. If you go through a jar within a week, you can keep it in the pantry, but if it takes you a while to use it up, we recommend opting for the fridge. If you’re tired of having to toss groceries week after week because they just won’t hold up, know that it doesn’t have to be that way. By following our simple tips on how to prevent spoiling, you will enjoy your food for longer periods, not to mention, you’ll save money on groceries too! With more than 10 years of experience, consider RestoPros your go-to mold expert! For more information on our superior services, give us a call today at (855) 587–3786.